I am always excited when I finish a quilt, especially this one. It had lots of firsts for me. Looking back through the posts on this blog, it is evident how long it was in the making. I actually started it in September 2017. That really IS a long time. It was a Craftsy class project, designed and taught by Lynette Jennings, a quilter I have admired for years. 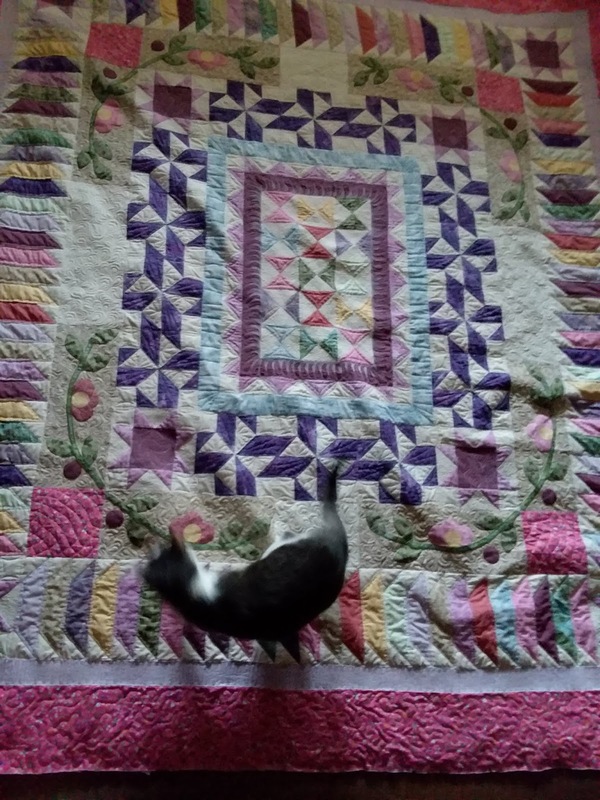 I was honored to do one of her quilts, despite this one being way outside my comfort zone. Even though I felt it was too busy, I was drawn to it. I liked that this was a medallion quilt, which was new to me. Even though I’ve been quilting for more than 20 years, I still consider myself a novice. There are so many things I’ve never done. I’m a perpetual learner. I want to try everything out there. You might call me an adventurous quilter. The result is that I’ve never stuck with one thing long enough to become proficient. I guess I’m still searching for the best techniques for me. Trouble is, I love them all, from intricate piecing to paper piecing, applique, and everywhere in-between. This had a little of everything. My first and perhaps biggest challenge was the color pallet. I wanted to make it my own. After all, isn’t that why I collect fabrics, to have my own stash? Since there are a lot of colors, this task was a little daunting, but I persevered. I began my quilting life making monochromatic quilts. I was drawn to one basic color and all its variations. But, I’m growing. I’m beginning to love all colors. In fact, the more the merrier. Named the Garden Charms Quilt by its creator, I recognized that gardens, which I love, contain all colors. And so should my quilt. I enjoyed the construction phase. I love cutting, piecing, and sewing. While I don’t ever achieve perfection, I always strive for it. I often have to settle for the best I could. I did a few motifs more than once, ripping out more than a few seams. I wanted points to match and seams to line up—again—not perfect but acceptable. I even made a table runner to practice one of the parts I was struggling with. Once the quilt top was finished, I labored over the most daunting part about this quilt, machine quilting it on my little Janome. I never machine quilted a huge quilt before. I wasn’t sure how this would turn out, but I was encouraged by those in the quilting community that have already accomplished this. I figured I could to. I do have a stubborn streak when I make up my mind to do something. While I pondered and questioned my own skills, and sought computer guidance, my poor quilt top just sat around. It was quite some time before I finally got around to working on it again. Life gets in the way. While I am busy taking care of my disabled husband, the house, our six cats, and all the other things that must be done around here, admittedly, I was also terrified of how difficult it would be to quilt this humongous quilt in my teensy-tiny quilting space. I don’t have a nice sewing room with tons of space. I quilt at a breakfast nook just off the kitchen. But, as it turns out, this was not a problem, at all. A couple of months ago, I was ready. I had talked myself into jumping in with both feet. So last December, I got busy. The eight yards of fabric I was to use for the quilt backing, was still in a bag. I took it out, measured, cut, and pieced it. I dragged out a roll of batting, and lay it all on my small, round dining room table. I put my ironing board at one side, and pressed the backing, quilt top, and sandwiched it all together. I then pin basted it with curved safety pins. Pin basting is not fun, but when it was finished, I got a sense of what this might look like as a quilt. That was an exciting step. A little more than a week later, I started quilting. I had no idea how I was going to quilt it, but this would be the fun part. I started in the middle and worked my way out. I did just a little at a time so as to now overwhelm myself. I am still a little surprised that quilting a huge quilt in a breakfast nook would be possible. But, it turned out that was a perfect place. There is a wall behind my machine, so the quilt can’t fall off the back of a table. I keep an ironing board under the counter, and could pull it out when I worked, so it could hold the quilt on the side of me. 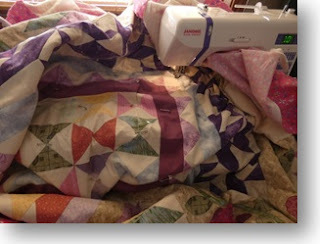 When I was finished quilting, I just put it back in its place. Between the kitchen and laundry room, my sewing area is out of the way so I could leave the quilt piled up next to my machine still under the needle. I could pick up right where I left off whenever I wanted to. It was perfect. I finished it a couple of months later. As it turns out, this is my favorite quilt. The latest one always is. I’ve been watching TV on the couch with it draped over me, usually with a cat or two on top. It is cozy; I love to feel the stitches. It reminds me of when my kids had their favorite blankets—their Neenees. Well this is my Neenee. The quilting is diverse with stipples and squiggles, grid work and feathers, giving it lots of different textures.